From the moment Lorenzo Valdez saved Angie Torres from being crushed by an angry mule, he knew she was trouble. Having rolled her out of harm’s way, he can’t deny that he is intrigued by the soft, delicate woman, especially when she races away without telling him her name. Angie serves as a spy to the Texians, aiding them in the Texas Revolution. 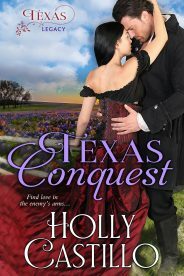 Her desire for the enemy soldier’s arms around her goes against everything she has been fighting for. However, their fate is intertwined and they are forced to work together. While Angie tries to protect her heart, Lorenzo must overcome his own demons. With the Texians on the verge of attacking San Antonio, Angie and Lorenzo have to fight not only for their right to love one another, but also for their lives and the future of Texas. Supplies had arrived. Anjelica Torres gnawed on her lip as she watched the weary mules trudging up the dusty road, three wagons in tow. She had no doubt they held precious provisions; blankets, boots—even guns. All things that the army camped across the river desperately needed. Angie nodded, not quite meeting her sister’s stern gaze. Holding her breath, Angie grasped the door handle and opened it just enough to squeeze through. She backed out onto the front porch, smiling to herself as she heard Olivia still talking. The door shut with a soft click and she faced the road with determination, watching the wagons slowly making their way towards the mission where the Mexican Army camped. Her palms were suddenly damp and she wiped them on her skirt, drawing a deep breath as she stepped off the porch and onto the road. There had to be a way she could get some of the supplies. Anything would help the Texians. The food they smuggled to them frequently helped, but the army was in desperate need for more. And if there was something she could do, she didn’t care about the risk. The wagons were kicking up plumes of dust and dirt and she coughed, waving her hand in front of her face, squinting against the fading sunlight. This wasn’t getting her anywhere. Frustration chewed at her nerves. She needed a plan; at the very least she needed to know exactly what was in the wagons. The longer she took waiting, the closer the wagons drew to the Alamo. Grandma always warned that curiosity killed the cat, and Angie was feeling very much like a feline as she caught up with one of the wagons and tried to reach for the rail. Once on the wagon, she could examine the contents. At the very least, the information would be invaluable to the Texians. She would worry about how she would get off the wagon later. She stretched, half skipping on her tiptoes, but she couldn’t quite reach the rail. She was going to have to run and jump. Her heart was pounding loud in her ears as she kept her eyes focused on the driver. He hadn’t noticed her yet, but he would probably notice if she jumped onto his wagon. She cursed under her breath. She needed a distraction, something to slow them down. The idea tickling the back of her mind was ridiculous, but she had to try. If it meant giving the Texians an upper hand, by God, she would do it. Freedom was worth any cost at this point. A mule squealed and reared in front of her, its paws striking at the air, forcing the mule tied next to it to stumble sideways. She had been running too fast and couldn’t stop quickly enough. Her skirts flew out in front of her as she tried to skid to a stop, but her feet slid on the loose dirt. Dead cat. The fleeting thought struck her as hooves hovered dangerously over her head. A flash of movement to her side caught her eye, but she didn’t have time to pay attention. She was trying to remember every prayer and every saint. The hooves were coming down as she brought her arms up, hoping to shield herself some from the blow. The forceful slam from the side was unexpected and she was suddenly rolling, over and over into the road. Something was wrapped around her, shielding her head from the ground. Motion stopped and she lay momentarily stunned, struggling to pull in a breath. She cracked her eyes open slowly and the setting sun cast shadows over the face looking down at her. For a brief moment, she feared her sins had caught up with her and she was in hell. For surely it was the devil that stared down at her, watching her with dark eyes. The shadows cast over his face prevented her from seeing more, but he was shaking his head. She couldn’t catch her breath and realized distantly that it was partially because he lay on top of her. The man was large, his broad shoulders keeping the sun from hitting her face, and every inch of her body was covered by his. From her toes to her breasts, she could feel his muscles and a tiny quiver settled in her stomach. Humiliation tinged her cheeks as she realized they were lying out in the center of the road. She couldn’t seem to pull a rational thought into her mind. His arms were under her, his hands cradling her head, his chest crushing hers to the ground. No wonder I can’t breathe. His heart beat against her breast, steady and hard, and her heart skipped a beat. She had never been this intensely aware of another person’s body. She once again tried to pull in a deep breath and several scents assailed her at once. He had just eaten something sweet, maybe a late blooming berry, and the scent carried on his breath across her cheek. The warm, earthy smell of sweat and travel clung to his body, mixing with what she could only assume was his own musky aroma. The combination made her light-headed while at the same time desperate to get closer to this stranger. Perhaps a hoof had struck her in the head. She narrowed her eyes, trying to see past the shadows to the man who held her, when the commotion to her right drew her attention. The wagon driver gestured angrily at her as he fumbled with the harnesses to the mules, trying to correct the damage she had caused. His colorful curses were in both English and Spanish so as not to confuse anyone about the chaos. Her cheeks felt like they were on fire. Well, at least her plan had worked. But it had brought more attention than she had anticipated. She suddenly started shaking so badly her teeth chattered. She didn’t think she would ever forget the sight of those hooves coming down at her. “Are you alright?” The devil’s deep voice was soothing, gentle, and made her want to forget everything except the enjoyment of someone holding her and comforting her. Her arms reached up to his shoulders and she pressed at them lightly, testing his strength. The quiver in her stomach intensified at the feel of his muscular arms. He was all man, and he lay on top of her in the middle of the road as though he had nothing better to do. He shifted slightly, moving so the sun cast a small amount of light on his face. His gaze was intense, his brow wrinkled in a frown. The supplies! The thought demanded attention and her whole plan would be worth nothing if she didn’t act quickly. She started to push away from him only to be brought up short by his arms tightening around her, making her aware of how intimately their bodies were entwined. The wagon seemed to suddenly be a distant concern. He couldn’t be the devil. The devil wouldn’t care if she was hurt or had been trampled, would he? Angie stared up at him and licked her lips, tasting dirt and dust. It was as though his voice was hypnotizing her, making her forget what she needed to accomplish. He was carrying her to the sidewalk on the opposite side of the road from the wagons, and she should be upset. He was ruining her plan and all she wanted to do was stay with him. She needed to get away from this man who held her so gently and made her forget everything else. The driver was climbing back up in his seat, still grumbling about the crazy woman. If she didn’t hurry, the wagons would be gone. The man slipped his arm out from beneath her knees and she was suddenly standing on trembling legs. She turned her gaze to his face and drew in a deep breath. She had been right to think he was the devil. The priest had said many times that el diablo showed himself in the form of temptation and beauty, and the man standing before her was exactly that. His hair was thick and black and curled slightly on his forehead. His high cheekbones and strong jaw spoke of an aristocratic heritage, and his face, bronzed by wind and sun, made his dark hair and eyes prominent. It was true she was still trembling. But it wasn’t the remnants of fear that made her quiver. She lifted her chin and tried to push her hair out of her face and suddenly became aware that he still held her, his hands gripping her waist. Her face flamed as she grasped his forearms and tried to push him away. Her heart was hammering in her chest and she could feel where each of his fingers touched her body. Surely, she had hit her head on something. He brought his hand to her face and the clean scent of mesquite surrounded her as his thumb brushed dirt off her cheek. She swayed slightly towards him. His strength, his aroma, his voice—everything about him made her want to get closer, to trust. It was an emotion she couldn’t afford. Angie bit down on her lip and glanced sideways at the wagons. They were beginning to move. She looked back at him and blinked—hard. Her hands were still holding his forearms and she looked down at them, recognizing the red sleeves. Dear God, how could she not have seen it before? She looked back into his face, shaking her head. He was a Mexican soldier! “What possessed you to run out in front of that wagon?” he demanded, his frown deepening, his thumb still caressing her cheek even though the dirt was gone. With one hard shove, she pushed free of his grip and stumbled backwards. He watched her with raised eyebrows, folding his arms over his chest. The wagon picked up speed and rumbled past them, and she wanted to curse louder than the driver had. She took a few more steps backwards, finding it difficult to take her eyes off of him. Then she spun on her heel and picked up her skirts. His gaze burned on her back as she started to run. She ran harder, furious with herself. He was the enemy! And she had enjoyed his arms more than any sane woman should. A light frost covered the ground, creating a surreal appearance in the field surrounding him. Lorenzo Delgado watched the landscape, his eyes the only part of him that moved. Unlike his partner, who shifted from one foot to the other, rubbing his hands together. “You’d do nothing, pendejo. You know the orders.” A third soldier swaggered up to them, casually rolling a cigarette. “For some reason Cos doesn’t want the locals bothered.” He shrugged. Lorenzo looked away from the soldier, returning his gaze to the fields where they were supposed to be watching for a possible attack. He understood the frustrations of the man. He hadn’t thought it could affect him until he had held a sweet-smelling woman in his arms. He had arrived in San Antonio only a few hours earlier, tired from the long trek from Laredo when he had seen the woman. Though his feet ached and he wanted nothing more than a few hours of sleep, he didn’t complain when he was ordered to patrol. He was finally where the action was with the Texian Army camped so nearby. The wagons that had followed them from Laredo were kicking up so much dust on the road that he almost didn’t see her. But a flash of color drew his eyes and he stopped on the sidewalk, watching the woman walking quickly beside the wagon, unaware of his presence. Her hair was dark, falling past her waist, sweat-dampened tendrils curling at her temples. She was chewing on her lower lip, her hands gripping her pale blue calico skirts as she tried to keep up with the wagons. What the hell is she doing? Suddenly she disappeared between two homes. He walked forward slowly, curious about the woman with olive skin and gray eyes, wondering why she had been trying to keep up with the wagons. He was about to step off the sidewalk between two houses when she came flying past, her skirts hitched up past her knees. “Startled” wouldn’t be a good way to describe the reactions around her, his lips pulling into a smile, seeing the scene in his mind instead of the frost-covered field. He hadn’t had much time to really consider his reaction. One moment he was admiring a glimpse of long, smooth calf and ankle, the next she was lying beneath flying hooves. He raced forward, a hoof glancing off his shoulder as he threw himself at her, wrapping his body around her to keep her safe from the rugged road. When their mad tumble came to a stop, he was assaulted by the feel of soft woman and the scent of lavender. He nearly hadn’t been able to get his voice to work to ask her if she was all right. How long has it been since I’ve held a woman? And when he had allowed himself the improper caress of her cheek, the feel of her silken skin had nearly undone him. Far to the side of his vision some tall shrubs shuddered. His eyes narrowed and he forced the image of the Spanish beauty out of his mind. He supposed he should be grateful he was on patrol where the cold, numbing air forced him to keep his mind on task. The Texian Army camped just outside of the town at a bend in the San Antonio River. Though the ragtag group of farmers and drifters hadn’t made any true rushes at the town, Mexican General Cos was well aware how much the rebels wanted to capture the Alamo. It would be a huge achievement in their quest to free Texas from Mexico rule, but it was virtually impossible they would succeed against the much larger Mexican Army. “Where are you going, hombre?” his partner asked, reluctant to leave his reclining position against the tall pecan tree. Did you know that Texas Conquest and many titles are available digitally from Tule's own bookstore? Check it out!